React: After you take casualties for losing a round of a shootout, pull. For each dude you discarded or aced as a casualty this round with a value higher than the pull, the winner takes 1 casualty. The situation in which you'd want to play this card is when you have a large posse and you take only 1-2 casualties, ideally in a draw. This does happen quite often because the most common hand ranks in a shootout involving studs are 7 and 8. You can also use Force Field to raise your hand rank to that of your opponent, so that you both suffer 1 casualty but you're still considered to be the loser, and then play Hot Lead Flyin'. Still, in a big gunfight you'd probably prefer to play cards that help you win in the first place and keep all your dudes alive, rather than orchestrate a kamikaze explosion. Next, the pull part. This forces some serious deckbuilding restrictions: you need to play lots on low value cards, and at the same time have high-value dudes in your posse. This puts an end to the idea of zerg-rushing with lots of small dudes from the start, because those cheap dudes all have very low values. Actually, it might work in the Sloane Gang, where you have not only Travis Moone (5♠) but also Barton Everest (5♠), Ulysses Marks (7♠), and Silas Aims (8♠), all costing less than 5. The worst part of this card is its value of 6♣, which is counter-productive to its pull effect. If you build around 6s, you probably won't find many dudes with a higher value in your posse, so the best you could get is 1-2 casualties for your opponent. And if you build around lower values and take Hot Lead Flyin' off-value, well, that just doesn't seem very cost-effective. Verdict: Hot Lead Flyin' forces some serious deckbuilding restrictions on your deck, while providing only average effect in the best of circumstances. 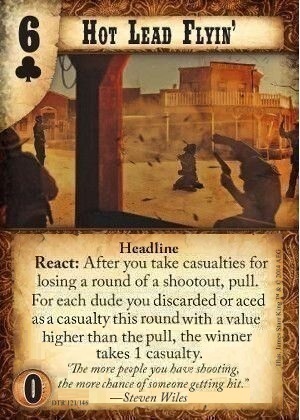 "Action Headline React: After you take casualties for losing a round of a shootout, pull. For each dude you discarded or aced as a casualty this round with a value higher than the pull, the winner takes 1 casualty." Ok first off, this is now a Headline so you can only play one per shootout, and your opponent can block you from playing it by playing a Headline of their own. Secondly the way the ability works has had a major overhaul, it now requires you to actually take casualties and it's efficacy is based on those casualties. Note, this new HLF will not work with token casualties. The image is named with the correct OCTGN id. Posted with permission form Pine Box.